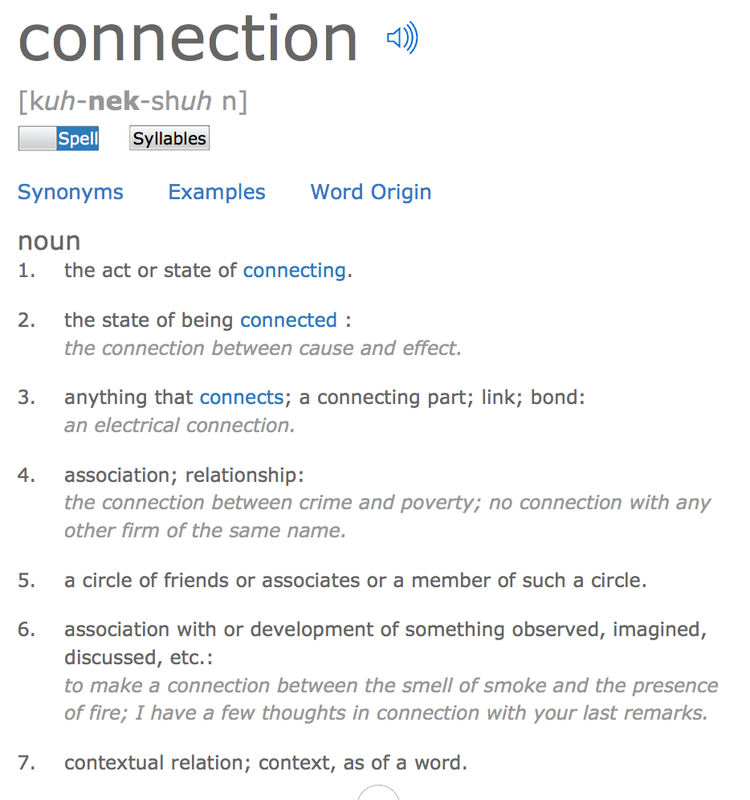 I’ve written about connections before in It’s All About Connection. In fact, I have come to believe that connection and all of its implications is one of the most important concepts in understanding, engaging in, and facilitating powerful learning experiences. As a follow-up to that post, I am amplifying my call to action to say that I believe it is the responsibility of every educator in this era of learning to share . . . resources, ideas, success, challenges, ahas, student insights, anything education related. Sharing takes on many forms. Educators can talk to colleagues, write blogs, tweet, present at conferences – both virtually and face to face, talk to the media, and/or create a media product – video, podcast, photo essay – and post online. On a personal level, sharing assists the educator in becoming a better educator. The act of sharing requires reflection and preparation. The educator needs to reflect on his or her own practices to identify which ones they want to share and also needs to put that sharing artifact into a form (e.g. writing, images, audio, video) that will understood by an authentic audience. This process tends to help the educator improve instructional practices. On a broader, more systemic level, sharing one’s experiences benefits other educators which, in turn, has the potential to advance the entire education field. It is the collective responsibility of all educators to create the change that they want to see in the education world. There really is no they in education. The they is really we-us. The we-us now have the means to have a voice. The educator becomes a connected educator and through sharing, is an active participant and contributor to the connected educator movement. The gap between what is and what could be in education is larger than it ever has been. I believe this is largely due to technology and the ability to establish global connections because of social media. Educators are more connected and more aware about education trends than any time in the history of public education. Imagine how education could be transformed if all educators use their own personal, often passion-driven voices. The bottom line is that if any individual educator believes there are flaws in the education, that it can be done better, then s/he has the responsibility to say something. I reaching the point that I am starting to believe it is a moral imperative for educators to share what they know to be true with other educators; and with administrators, students’ families, community members, politicians . . . the larger global society. Learners should be producing as much as consuming content. 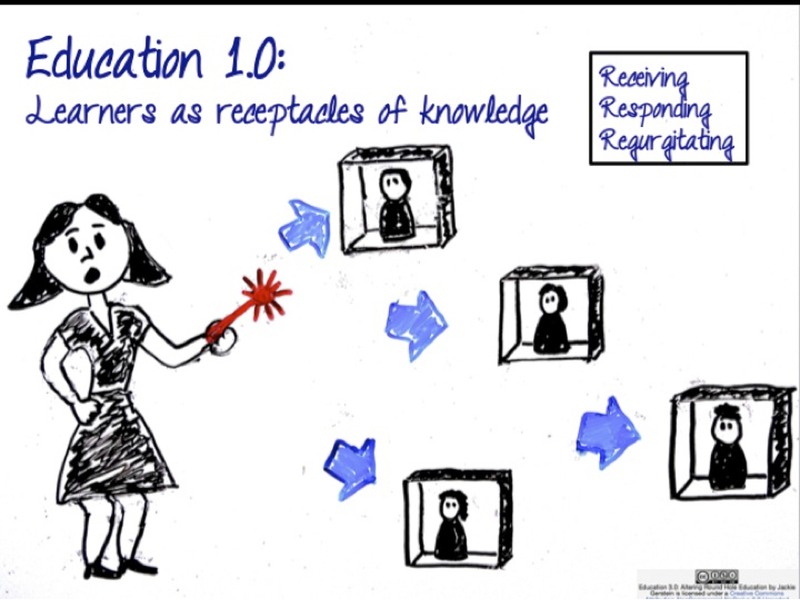 Learners (of all ages) should be adding value and contributions to knowledge bases. Learners should be given opportunities to express their unique voices. Learners should be given opportunities to be creative and innovative. Learners should be asked to synthesize and analyze content in unique ways tapping into higher levels of Bloom’s Taxonomy. Using on-linguistical representations support visual thinking skills. Here are some samples from this term. 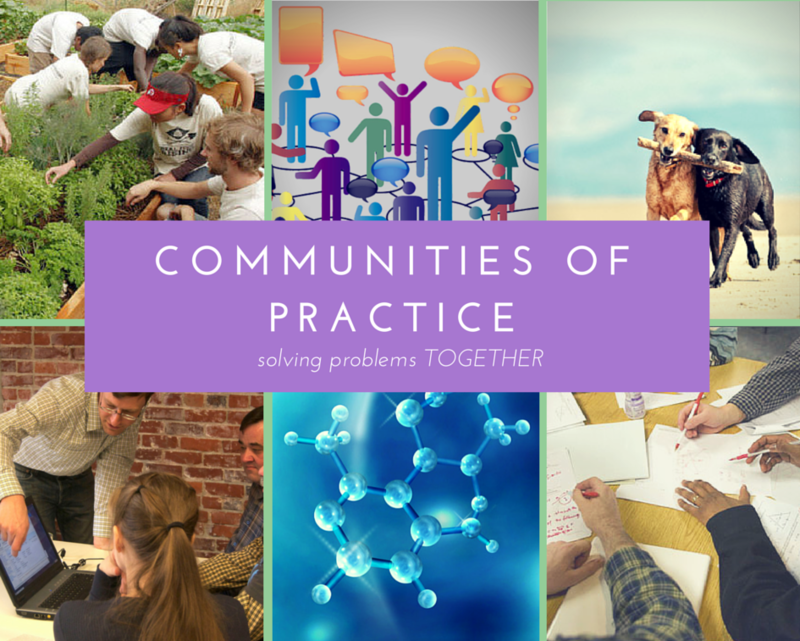 Communities of Practice are demonstrated by multiple instruments playing a major scale. All the musicians share the same passion (the scale). At first the musicians are out of sync but as they continue to work together and learn more the music begins to come together. By the end they are all playing together (Wenger, n.d.). I felt this was a good representation of how learning can be facilitated through Communities of Practice. Personal Learning Networks are demonstrated through the use of drum beats. It starts with just one beat and slowly more and more beats are layered on top making the music (the learning) grow. The use of all drums represents the similar interest shared by people in a PLN and the variations in the beats represent how each person brings a unique perspective to the learning environment (Kharbach, 2012). I created this graphic of concentric and overlapping color sections with faint lines spreading out from the center of the image. It looks a bit like a colorful radar screen and I thought that was a good analogy to what we are learning in this course – how to develop an internal radar for new ideas and how to evaluate and share information through social media and knowledge networks. I wanted to represent this idea with an image that could show a meta-view of connection levels and the varying types of intensity and interaction that can be found in each level. The graphic appears concentric but information and connections can actually move in either direction – between the PLNs and CoPs as well as the specialized nodes and fringe connections at the outer edges. The variety and intensity of colors represent the diversity needed at each level for learning and knowledge creation. Color tint and opacity also represents the blending of new ideas and information to create original digital content in both the PLN and CoPs levels. 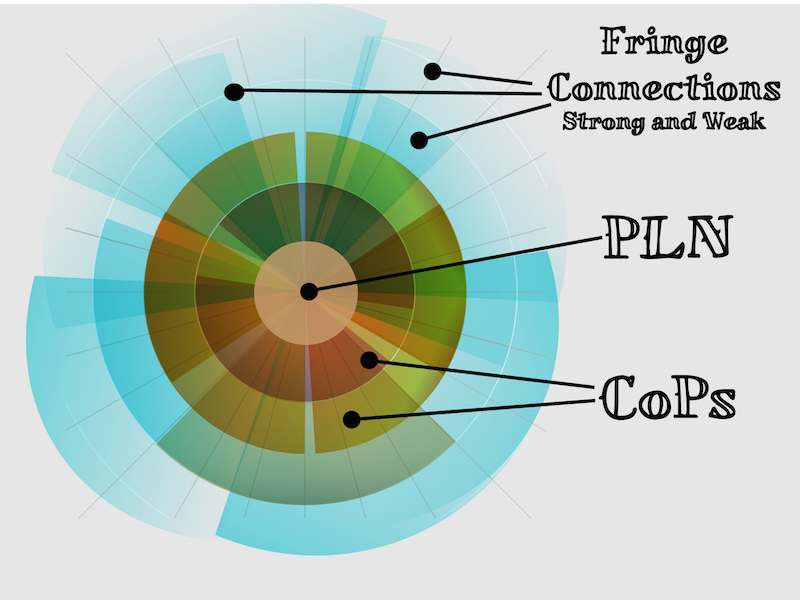 The graphic contains layers of browns orange, tan and green colors – these are connections with more intense and dynamic interactions happening in the PLN and CoPs layers. Thus, the PLN area at the center of it all, represents a trusted “inner circle” of practitioners that know each other’s skills and areas of expertise well. Diversity, to a certain extent, is important in a PLN, but not so much that strong bonds and bridges can’t be built between areas of expertise and content. The relatively solid color of center area in the graphic represents this consistency dynamic found in productive PLNs. As the colors layer and blend, they create new colors, tints or shades that represent skillful intent of CoPs. The analogous color blends and variations in the CoPs area are also meant to be reflective of Wenger’s idea that learning is not just for the individuals within a CoP, but also for the community as a whole – this results in enhanced practices and a more effective CoP overall. I feel as though these ideas work as a set of nesting bowls, each one a bit larger than the next. I see the PLN as the smallest unit of knowledge sharing since it is based on the individual and their learning interests (Lalande, 2012; Trust, 2012). The next largest unit is the CoP as it is based on a membership of interested shareholders working towards the same endeavor (Smith, 2010). Each CoP member brings their own PLN along with them resulting in a much larger set of networks and knowledge connections. Connectivism is the theory that consolidates all of the ideas. It is the framework or mechanism that describes the way in which networks function and knowledge is shared or acquired within a PLN or CoP. As a means of showing these concepts are connected, I maintained the structure of each postcard. Likewise, there are images in each postcard that are similar to show the relationship. 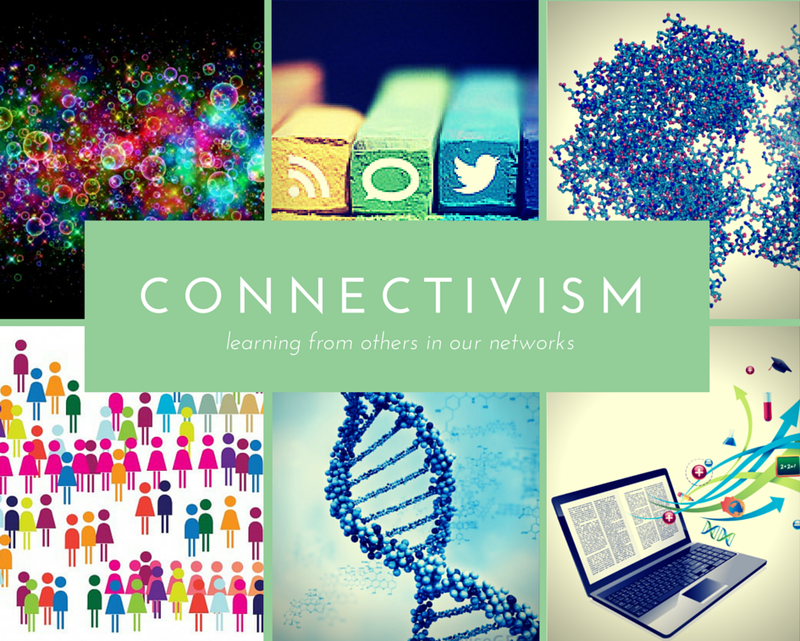 For example, both the PLN and connectivism postcards feature social media references. Likewise, the CoPs and connectivism postcard have images depicting groups of people. There is an image at the bottom center of each postcard that relates to this topic. The PLN postcard features a depiction of an atom. The CoPs postcard shows a molecule and the connectivism postcard features a macromolecule (specifically DNA). Since the atom is the smallest unit of all three, I felt it best portrayed the PLN. The PLN is determined by each individual in terms of the connections made, tools used, and people or organizations included. A person is free to determine whether or not they will lurk or share within their PLN (Lanlande, 2012). A CoP is much larger than that of a PLN because it requires a group of people committed to the same problem or endeavor (Smith, 2010). Each molecule is made up of a series of atoms, much like a CoP which consists of group members and their respective PLNs. Connectivism describes something a bit different than the PLN or CoP. Connectivism deals with the new landscape of information and technological advances that characterize the modern world. Its focus is on the complexity of information and the means of networking to acquire and share information (Kop & Hill, 2008; Siemens, 2005). Thus, the macromolecule (DNA) seemed to be a good fit for the concept. DNA simultaneously represents a colossal collection of atoms and molecules (PLNs and CoPs) that share information via their connections. No one molecule or atom stands out as superior to the others, much like one individual can no longer exist as an expert as argued by Siemens (2005). My non-linguistic representation is an interactive version of Da Vinci’s Vitruvian Man. My idea was that our feet are the base of a person. I see one’s personal learning community as their base that provides support. In that area I included a spider developing his web or network as it represents how over time people build their web/network. I included a picture of a map because it looks like the veins and arteries of the city as it connects people across boundaries just as our personal network connects us across space and time. A picture of fabric for knitting is a metaphor for how we knit our own network to fit our individual needs. As Dr. Buchem explained in her presentation, when people feel personal control over their learning, they approach it with more passion and commitment. Finally, if the creation of something complex and interwoven had a sound, I always envisioned it sounded like Struggle for Pleasure by Wim Mertens. For the main joints, I placed images of connectivity. Some are obvious, like the Chain Bride in Budapest, a chain link fence or a satellite. The grand canal of Venice (Blue Venice) by Manet works in two ways. It is a boat traveling across the water which is a way of travel and staying connected, but also with it being from his impressionist period, it is made up of seemingly random strokes of color. Up close, it appears a mess. From a distance, we can see each color and each mark works perfectly with each other and creates a beautiful image. Located the URL for my blog with posts tagged with Education 3.0. Uploaded the PDF to Issuu. 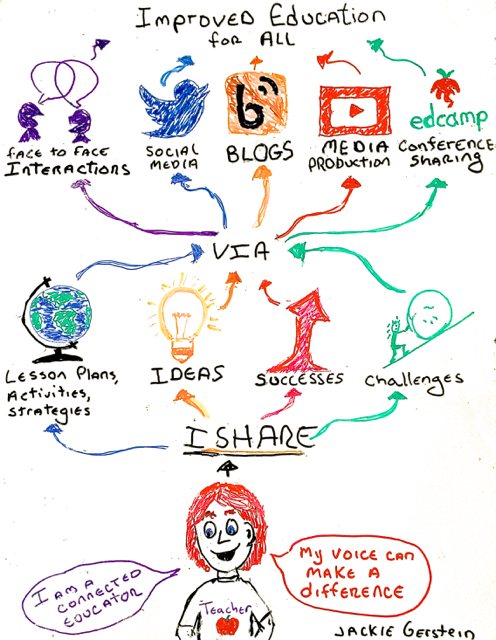 A good amount of education-related social media in the past few months has focused in being a connected educator. 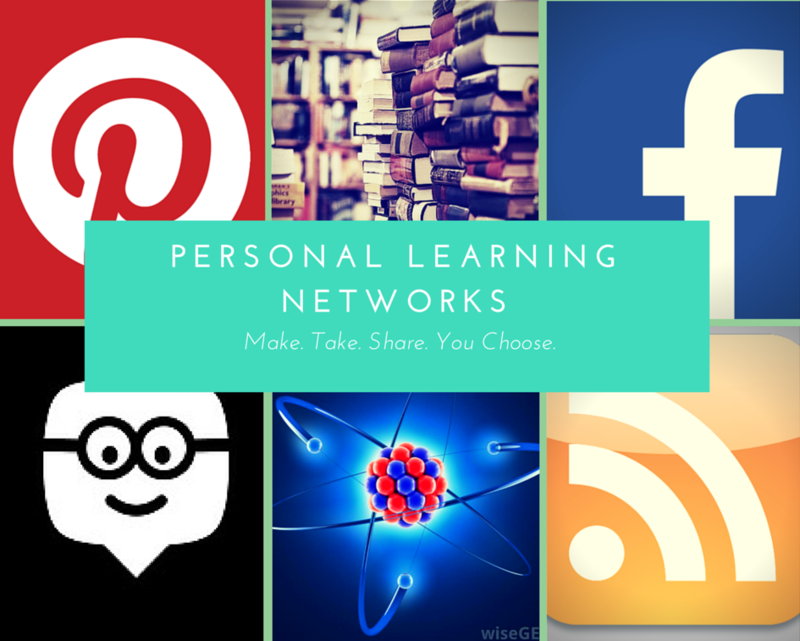 The context of these discussions is about the educator being connected to other educators via social networks and developing their personal learning networks. Kids don’t learn from people they don’t like. Teachers should leave legacies of relationships that can’t disappear. Sir Ken Robinson also discusses the importance of the student-teacher relationship in Why We Need to Reform Education Now. To improve our schools, we have to humanize them and make education personal to every student and teacher in the system. Education is always about relationships. 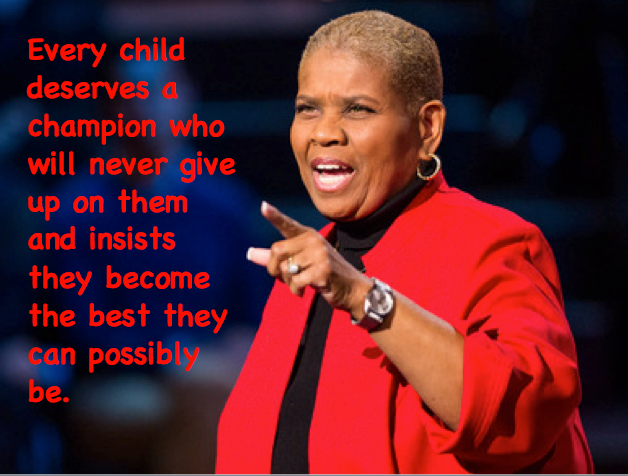 Great teachers are not just instructors and test administrators. They are mentors, coaches, motivators, and lifelong sources of inspiration to their students. All young people have unique talents and interests. In his moving poem, Malcolm London argues that education has to connect with the real lives of young people and not stifle their hopes and dreams. To do so, teachers need to become a type of ethnographer of their students, which I discuss in more detail in Teaching as a Human – Humane Process. The teacher as an ethnography gets to know individual students as individuals, being able to assess what the student needs when. Teaching as a human-humane process translates to knowing when to push, when to pull back, when to ignore, when to encourage, when to praise, when to critique, when to challenge, when to nurture, when to cheer, when to show love. Being fair with students is not about providing all students with equal treatment at all times. This actually leads to unfair treatment of students as they are individuals and are not like widgets – equal in all respects. It also acknowledges and honors that individual students differ from day to day, sometimes minute to minute as they continue to learn, grasp concepts, change moods, change relationships, and to grow. This translates into continually assessing individual learner needs and offering them what you think they need to grow and learn at any given moment. The result are those light bulb moments, when a learner “gets it” – understands something that s/he has struggled to understand, when his or her self-efficacy rises, when a learner realizes s/he is smarter than previously believed – it is these moments that are the most meaningful for me as an educator. Schools are doing Education 1.0; talking about doing Education 2.0; when they should be planning and implementing Education 3.0. This post seeks to compare the developments of the Internet-Web to those of education. The Internet has become an integral thread of the tapestries of most societies throughout the globe. The web influences people’s way of thinking, doing and being; and people influence the development and content of the web. The Internet of today has become a huge picture window and portal into human perceptions, thinking, and behavior. Logically, then, it would seem that schools would follow suit in mimicking what is happening via the Internet to assist children and youth to function, learn, work, and play in a healthy, interactive, and pro-social manner in their societies-at-large. 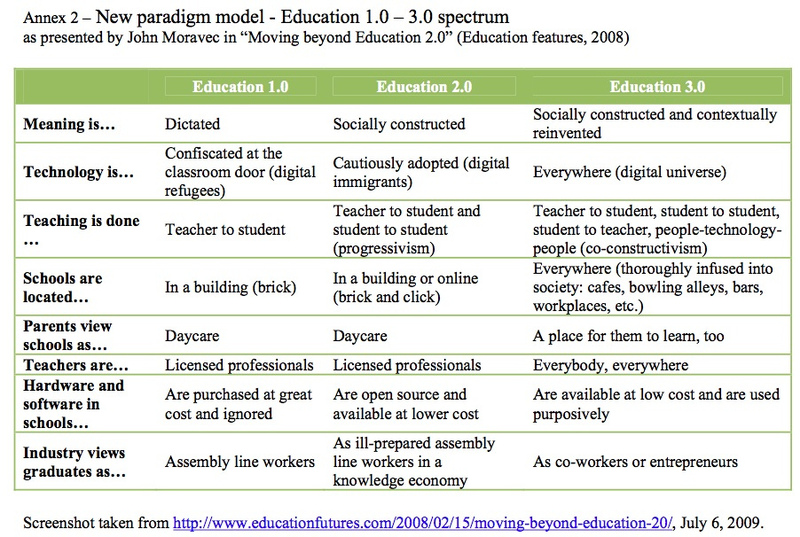 Most schools are still living within and functioning through an Education 1.0 model. Although many would deny this, they are focusing on an essentialist-based curriculum with related ways of teaching and testing. This description (1) rings true with a lot of schools in this age of standardization, accountability, NCLB, Race-to-the-Top, Common Core Curriculum Standards, and (2) has a lot of similarity to Web 1.0 . . .
Derek W. Keats and J. Philipp Schmidt provide an excellent comparison of how Education 1.0 is similar to Web 1.0. Similar to Web 2.0, Education 2.0 includes more interaction between the teacher and student; student to student; and student to content/expert. 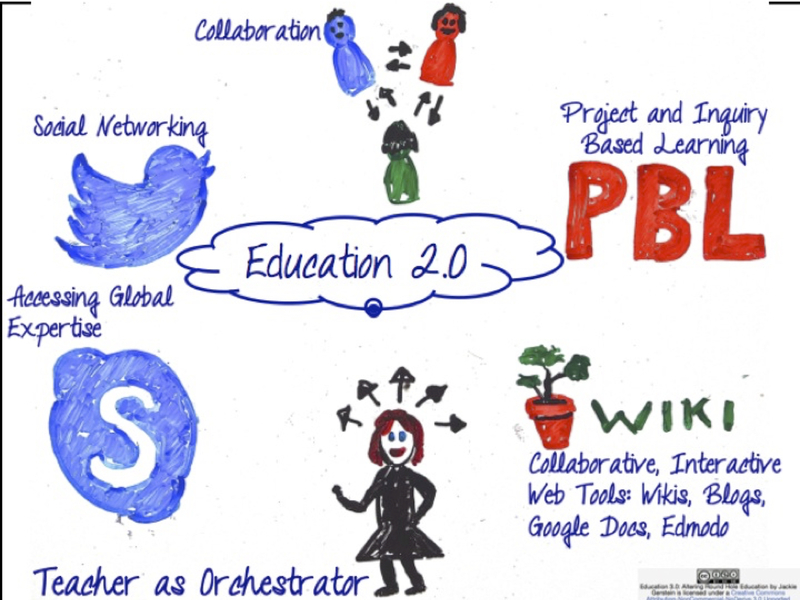 Some school administrators and educators seem to have taken some steps and moved into a more connected, creative Education 2.0 through using cooperative learning, global learning projects, Skype in the classroom, and shared wikis, blogs and other social networking in the classroom. But in 2013, this should be the norm not the exception. Education 3.0 is characterized by rich, cross-institutional, cross-cultural educational opportunities within which the learners themselves play a key role as creators of knowledge artifacts that are shared, and where social networking and social benefits outside the immediate scope of activity play a strong role. The distinction between artifacts, people and process becomes blurred, as do distinctions of space and time. Institutional arrangements, including policies and strategies, change to meet the challenges of opportunities presented. There is an emphasis on learning and teaching processes with a focus on institutional changes that accompany the breakdown of boundaries (between teachers and students, higher education institutions, and disciplines) (http://p2pfoundation.net/Education_3.0). 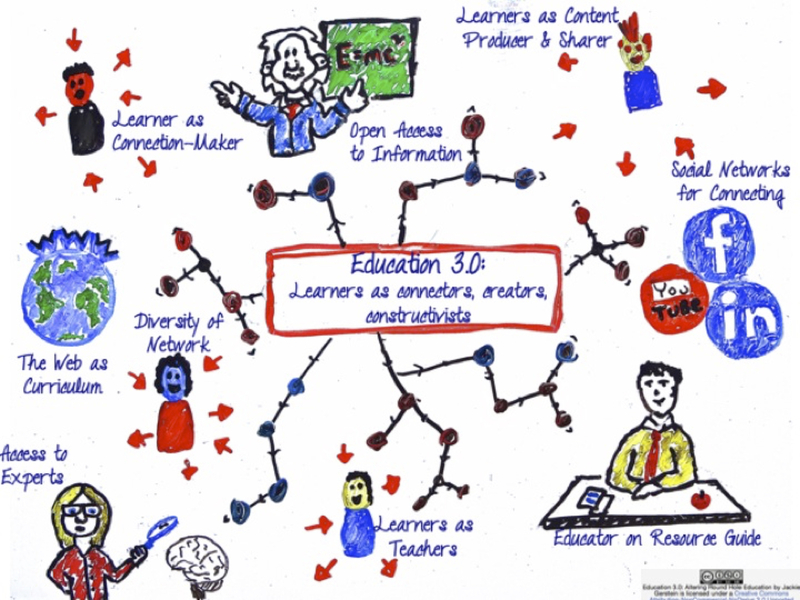 Education 3.0 is a constructivist, heutagogical approach to teaching and learning. The teachers, learners, networks, connections, media, resources, tools create a a unique entity that has the potential to meet individual learners’, educators’, and even societal needs. Growing interest in alternatives to teacher-centred approaches such as constructivism (Dewey, 1998), resource based learning, etc. The emergence of Web 2.0, including blogs, podcasts, social interaction tools, etc. Connected learning taps the opportunities provided by digital media to more easily link home, school, community and peer contexts of learning; support peer and intergenerational connections based on shared interests; and create more connections with non-dominant youth, drawing from capacities of diverse communities. All of the pieces of an Education 3.0 are literally freely available for the taking, why aren’t those involved in the planning and implementing of schools integrating these ideas, tools and strategies into their systems? The time for planning for Education 3.0 was actual yesterday, but doing it now is okay, too. 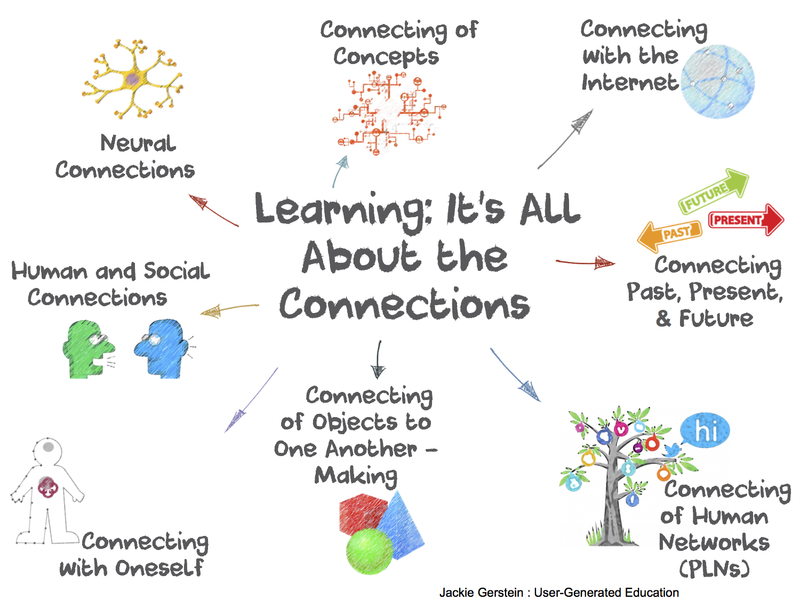 This is a post about connectedness and its importance for human growth and learning. Prior to this discussion, though, it is important to note that many educational institutions are silos of isolation (thanks to Sheryl Nussbaum-Beach for this term). Learners are often isolated from one another – told to pay attention to the teacher, not interact with one another during class time. Their connectedness often comes through recess, lunch, and secret texting to one another. Teachers and classes are often isolated from one another – remaining closed and isolated within the four walls of the classroom. Schools are often isolated from other educational and community organizations – “safe” within the confines of literal and figuratively self-built walls – done so under the auspices that learners must be kept inside and strangers kept from entering. These walls include firewalls that prevent the entering or exiting of social media and Internet content. To continue to exist, a system must be able to import energy across its boundary or have a capacity to create new sources of energy. A system that is able to import and export energy is called an open system. One that cannot import energy is called a closed system. A closed system that cannot generate a sufficient amount of energy internally to replace what is lost to entropy will die. Openness and connectedness has morphed into something qualitatively different due to the Internet, Web 2.0, and social media. In an interesting re-mix of Maslow’s Hierarchy of needs in this age of social media, Pamela Rutledge proposed that connectedness is at the core of all other needs. Needs are not hierarchical. Life is messier than that. 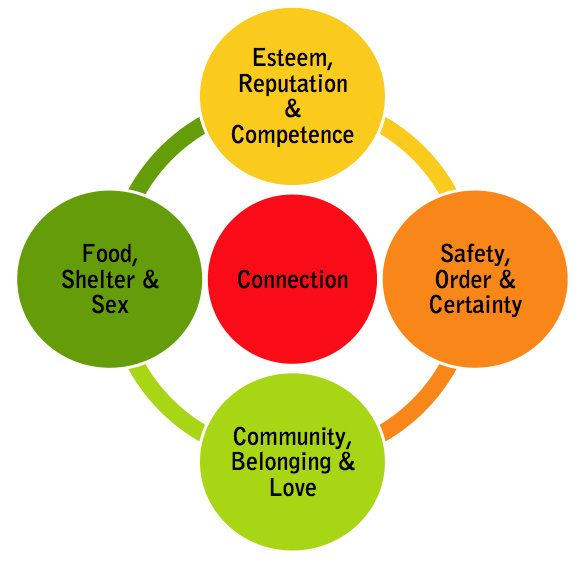 Needs are, like most other things in nature, an interactive, dynamic system, but they are anchored in our ability to make social connections. Social networks allow us to see, as never before, the interrelated nature of society and the palpable development of social capital from the emerging and intricate patterns of interpersonal relationships and collaboration. The strength of our networks and our bonds improve our agency and effectiveness in the environment. Our need for survival through connection plays out through every successful social technology. The Connected Learning Research Network introduced the Connected Learning initiative. It advocates for broadened access to learning that is socially embedded, interest-driven, and oriented toward educational, economic, or political opportunity. Equitable: Connected learning environments ideally embody values of equity, social belonging, and participation. Production-centered: Digital tools provide opportunities for producing and creating a wide variety of media, knowledge, and cultural content in experimental and active ways. Shared purpose: Social media and web-based communities provide unprecedented opportunities for cross-generational and cross-cultural learning and connection to unfold and thrive around common goals and interests. The benefits of connected learning cannot be overstated. Not only are learning objectives and content-area standards more likely to be achieved as students become more excited and engage in learning; but their social-emotional needs have a greater potential to be met. Schools are doing learners a disservice (verging on being unethical in my perspective) by putting up all of those walls that prevent connection.